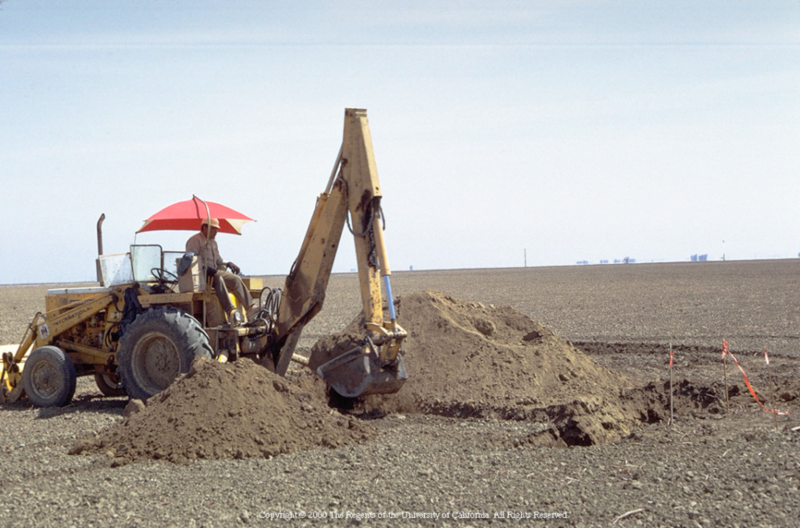 Adapted from the article “Site preparation for walnut planting”, by Bill Krueger UCCE Farm Advisor Emeritus, Glenn County in the August 2008 Sacramento Valley Walnut News. Preparation for planting a new walnut orchard should start with a soil evaluation. Walnuts have traditionally been planted on class one soils, the deepest most uniform well drained soils. Recent research and grower experience has shown that with the right preparation and planting system walnuts can be successfully grown on less than ideal soils. Soil evaluation will help determine the steps to take prior to planting to insure successful results. Soil survey maps are a good place to start. A soil survey for the area of interest is available at your local NRCS office or online. The soil survey will provide information on the type of soils present and their distribution and acreage. It describes each soil type and provides information about drainage, flooding, exchangeable sodium content and other details important to orchard success. The soil survey cannot provide all of the necessary details. Using a backhoe to further explore the soil can provide valuable information necessary for orchard development. Digging backhoe pits 5 to 6 feet deep in strategic locations where soil differences are expected will allow for a first hand examination of the soil. Look for stratified soil, compacted zones, hard pans, clay pans etc. Your local Farm Advisor may be able to provide assistance in the evaluation of the backhoe pits. Abrupt changes in soil texture can result in a perched water table which is unhealthy for walnut roots. Backhoe being used to examine soil. If soil modification is necessary it will be much easier to accomplish before planting. It should be done in the late summer or fall when the soil is dry to insure the most disruption possible while allowing winter rains to settle the soil before planting. Touch up leveling or smoothing can be done in the spring before planting. Leveling to smooth out low spots or improve surface drainage should be done to keep the future orchard healthy. Deep uniform soils may only require shallow ripping (1.5 to 3 ft.) to loosen the soil. Stratified soils or soils with hardpans or claypans will require deep ripping or slip plowing (3 to 6 ft.) to disrupt layers. Ripping is less effective for clay pan soil because the clay which will flow around the ripper and soon reseal. A slip plow, a ripper shank with an iron plate at a 45 degree angle, can lift soil at the bottom of the shank to the soil surface and permanently disrupt a clay layer. Ripping and slip plowing are typically done in two directions, with the second pass being diagonal to the first. Soil physical characteristics can to some extent be overcome by the use of low volume irrigation, especially under close tree spacing. Soil can be modified to a depth of 6 feet but large equipment is necessary and it is expensive. Backhoeing tree sites to mix the soil may be practical on sandy soils where it can be done quickly but will probably be cost prohibitive on heavier soils. Planting trees on berms is recommended on heavier soils. Ridge berms in the fall after soil preparation to allow for settling over the winter.